Karen Ogen- i Teach With Technology: Lego Fun Without Losing Blocks? Build With Chrome! Lego Fun Without Losing Blocks? Build With Chrome! I love using Legos in the classroom, but inevitably pieces get lost, students want the same blocks, and nobody wants to take their creation apart. Build with Chrome to the rescue! 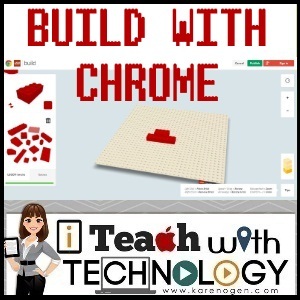 Build with Chrome is a partnership between Google and Lego where you and your students can build with virtual Legos. You can make some amazing creations with up to 1,000 blocks of varying colors and shapes. You must have a Google email account (or Google Apps for Education account) to save and share the creations. Because this is a Google Apps collaboration, once students are logged in and they create something they can share it on the World of Build Map or submit their creation to your Google Classroom account. -Create an ecosystem for an animal or an area. -Create something to write a story about using descriptive words, persuasive writing, figurative language, conversational writing, etc. Have fun building and creating!